extent to which ecosystem metabolism is altered. Although initially disruptive, organic matter may be deposited within the sediments as the flood subsides, and so the effect on ecosystem respiration may be short-lived. 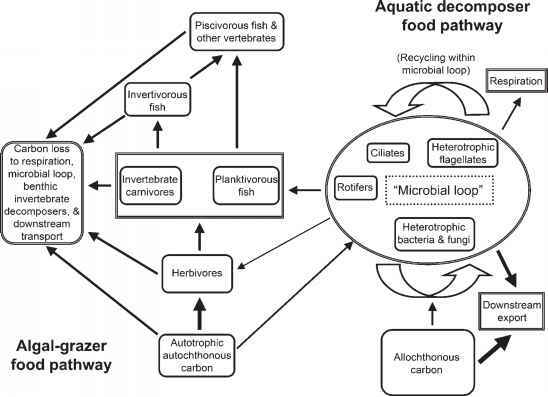 Light, nutrients, and other factors favoring algal growth will of course influence how rapidly the autotrophic community recovers. Stream ecosystem efficiency quantifies the extent to which all energy inputs into some areal unit of a stream are converted to CO2 versus exported downstream. In principle one could measure all inputs and total respiration rate, and if carried out for an entire catchment including its headwaters, this would be an appropriate measure. For any stream reach of perhaps a few hundreds of meters, such a calculation is inappropriate because of the quantity of material that is imported from upstream and exported downstream. Because organic matter transport is such a dominant process in streams, estimates of the travel time or distance of a C atom is a useful comparative measure. Carbon spiraling length includes two components: uptake length, which is the distance traveled in dissolved inorganic form before being immobilized by the biota; and turnover length, which is the distance traveled by an atom of C in organic form before being completely converted to CO2 by metabolic processes. These terms are also used for nutrient uptake and subsequent mineralization or release (see Figure 1.6 and Equation 11.5). Turnover length is a measure of ecosystem efficiency, and can be estimated from downstream C flux divided by ecosystem respiration (Newbold et al. 1982b, Newbold 1992). where Sw is the distance traveled by the particle in the water, Tt is the turnover time or the time that the particle remains on the stream bed, and Vw is water velocity. In their synthesis of many studies of breakdown and transport in the forested small streams of Coweeta, North Carolina, Webster et al. (1999) compared biological turnover time (a term that also includes physical and chemical breakdown) and transport distance for the four main categories of OM. Breakdown rates ranged from nearly 6 years for sticks to a few months for leaves, and exceeded 1 year for FPOM. Although these estimates are provisional for many reasons, the outcome is reasonable: transport rates were higher than breakdown rates for sticks, leaves, and FPOM. Particle turnover lengths were estimated to be 0.15, 0.11, and 42 km, respectively. Newbold et al. 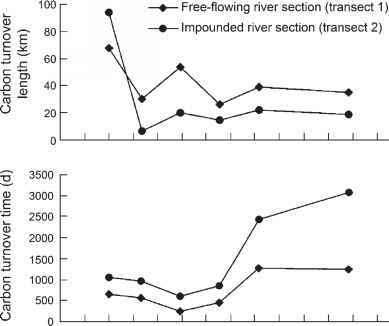 (2005) calculated turnover lengths of 38 and 59 km for two FPOM size categories in an Idaho stream. streams of the eastern United States, which they related to a downstream increase in concentrations of dissolved and particulate C and in discharge (Webster et al. 1995). In the Taieri River, New Zealand, organic C turnover length ranged between 10 and 98 km, with higher values downstream where discharge also was higher (Young and Huryn 1997). In the Snake River, Idaho, turnover lengths were between 11 and 108 km and were related to patterns in current velocity (Thomas et al. 2005). Organic matter that enters the channels of streams and rivers can be stored for some time on stream banks and by burial within the channel, but ultimately it is exported to downstream ecosystems or mineralized to CO2 by the biota. Export is the fate of a great deal of organic matter. An estimated 4 x 1014 g of organic C, roughly 1% of terrestrial NPP, is carried by rivers to the ocean annually (Meybeck 1981, Schle-singer and Melack 1981). This export consists of roughly equal quantities of POC and DOC. Present estimates are that 25% of C entering the world's rivers is processed within the system, 25% is stored as sediment POC, and 50% is transported to the oceans (Meybeck 1982, Mulholland and Watts 1982, Thurman 1985). Headwater streams that are dominated by allochthonous inputs of organic matter clearly are inefficient at processing this material, typically exporting more than is metabolized (Webster and Meyer 1997). As is evident from estimates of transport distances reported earlier in this chapter, more material is exported as refractory FPOM and DOM than is metabolized to CO2. The ultimate fate of this organic matter of terrestrial origin is less certain, however, as chemical evidence indicates it is decomposing on the continental margins, in river deltas, and perhaps in the lower reaches of rivers before reaching the oceans (Hedges et al. 1994). Coupled with the downstream decline in DOC concentrations in the lower reaches of some large rivers and the common finding of supersaturation of water in lowland rivers with CO2 (Cole and Caraco 2001), utilization rather than export may dominate in lower reaches of large rivers.